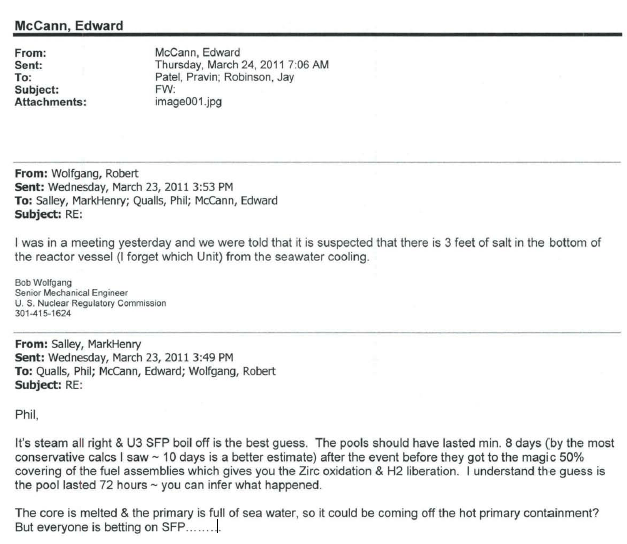 I was in a meeting yesterday and we were told that it is suspected that there is 3 feet of salt in the bottom of the reactor vessel (I forget which Unit) from the seawater cooling. It’s steam all right & U3 SFP boil off is the best guess. The pools should have lasted min. 8 days (by the most conservative calcs I saw – 10 days is a better estimate) after the event before they got to the magic 50% covering of the fuel assemblies which gives you the Zirc oxidation & H2 liberation. I understand the guess is the pool lasted 72 hours – you can infer what happened. The core is melted & the primary is full of sea water, so it could be coming off the hot primary containment?